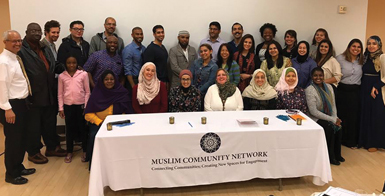 In the fall of 2017, the Muslim Community Network and its Board of Directors learned of a web link about an application for a grant submitted by Affinis Labs in 2016 to the Department of Homeland Security (DHS) on Countering Violent Extremism (CVE). In this application, Dr. Debbie Almontaser and her affiliation to the Muslim Community Network were referenced. In the application, Dr. Almontaser was named “the go to person in New York City” by Affinis Lab for New York City based artists. Upon learning about this CVE application link, the Muslim Community Network immediately contacted Affinis Lab requesting an explanation and requested and received an apology statement from Affinis Lab for the mention of our organization and our board president. In addition, we requested that Affinis Lab contact DHS to remove all references to Muslim Community Network and Dr. Almontaser from this CVE link. Muslim Community Network and its Board President, Dr. Debbie Almontaser, have not applied for any DHS grant, have not engaged in any partnership with Affinis Lab, have not received any funding from DHS, have not received any funding from any organization engaging in CVE work and have not engaged in any partnership with any organization engaging in CVE work. If you have any questions please contact us at info@mcnny.org.